The Rajya Sabha witnessed uproarious scenes today with the BJP raising a storm over allegations that Walmart had indulged in corruption to enter the Indian retail market and the Samajwadi Party forcing adjournment of the House over the quota in promotions Bill. Most Congress leaders in Jammu and Kashmir have said no to a pre-poll alliance with its current ally, the National Conference. 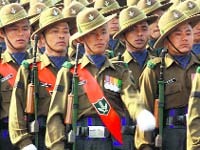 It wants to keep its options open for the next Assembly polls due in 2014. Mystery continues to shroud as to why slain Assistant Sub-Inspector Ravinderpal Singh did not leave the crime scene for about 20 minutes after being first shot at. One of the relatives of the ASI, who was supposed to have taken him away in his car, spoke to The Tribune about those crucial 20 minutes. Four labourers died in Faridabad today when a boundary wall of a crusher zone caved in. The incident happened late this evening at Pali crusher zone, reportedly owned by a Haryana Cabinet and rented by Sushil Kumar, a resident of Delhi. The police said the 12-foot boundary wall, which was freshly constructed, collapsed when a tyre of a JCB machine hit it. 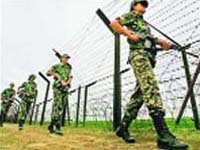 The Border Security Force will get 509 more border outposts (BOPs) along the country�s international boundary with Pakistan and Bangladesh to prevent infiltration and cross-border smuggling in the next two years.